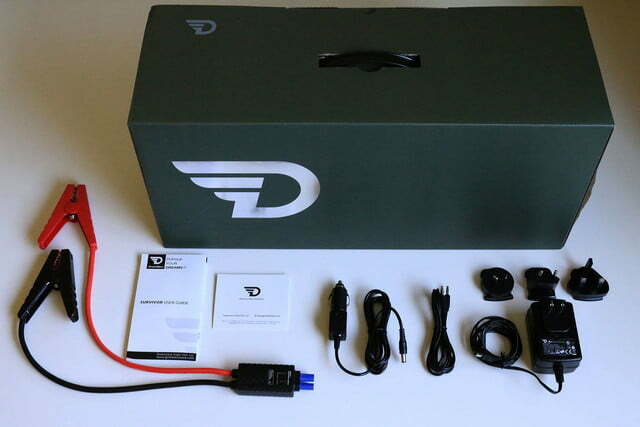 The DreamWave Survivor is a decent speaker, and it could save your car battery. A glance at the DreamWave Survivor’s chunky exterior immediately reminds us of the Panasonic Toughbook and Toughpad. These devices prioritized ruggedness above nearly every design element. They were hardly portable, and certainly ugly, but they filled a niche need and did it well. The Survivor isn’t necessarily such a device — but you can’t tell by looking. 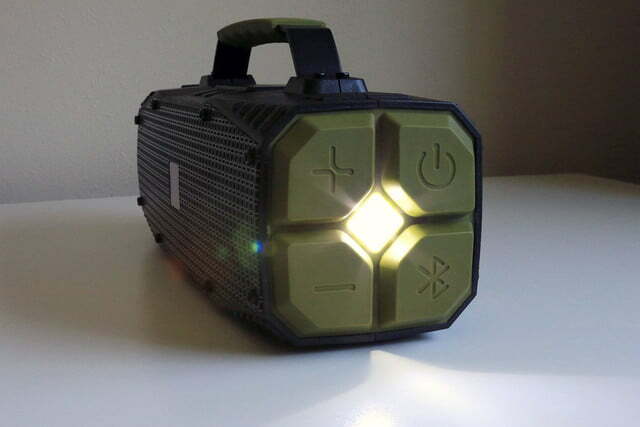 With its rugged, outdoor-element-proof construction, built-in LED flashlight, USB charging, and 12V car battery jump-start feature, and of course the ability to stream music via Bluetooth, the DreamWave Survivor’s feature set is an interesting collection of capabilities. But, as is often the case with products offering a number of functions outside their primary purpose, they end up yielding mediocre performance across the board. When it comes to the Survivor, whether or not it’s worth the price of entry will come down to which of those aforementioned features is most important to you. Function over form appears to be a hallmark of the Survivor, and that’s evident from the moment you get a look at the box. The army green container offers little in the way of frills or clever packaging, instead opting for a minimalistic vibe by way of a prominent logo and not much else. Since the Survivor is sold internationally, inside you’ll find an AC adapter with four interchangeable plug types for different regions. 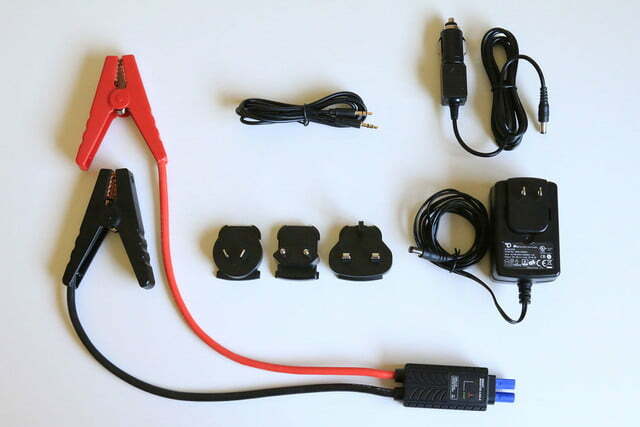 There’s also another adapter to charge the unit with a car cigarette lighter, a 3.5mm audio cable for direct line-in audio, a brief instruction manual and – by far the most unlikely peripheral of the bunch – a pair of jumper cables. It’s capable of jumpstarting a 7.0-liter V8 engine. For those who spend a lot of time outdoors and want to take their tunes with them, the Survivor seems like a tailor-made device. Camping, desert parties, and even motorsports all seem like activities where it would be a welcome addition. The Survivor is also IPX5 compliant, which, by definition, means that along with being dust, dirt, and snow resistant, it can withstand a jet of water from a 6.3mm nozzle sprayed at any part of the device for up to three minutes. 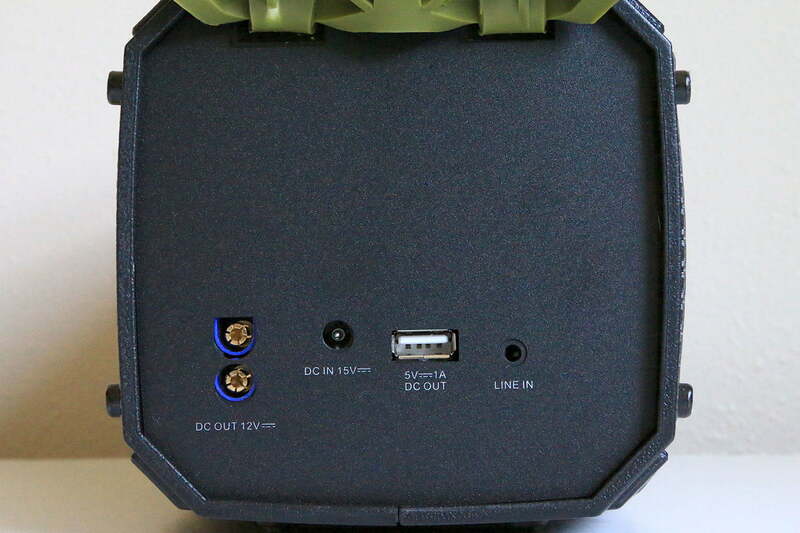 The boombox-like design is well-suited to withstand harsh outdoor environments, with rubberized covers on either end of the device, one side offering the power, Bluetooth pairing, and volume controls, and the other side protecting the USB, 3.5mm line-in, AC adapter, and 12V DC ports from the elements. An NFC pairing chips sits atop the device. With its rubberized handle on top and traditional boombox layout, portability is fairly convenient, though at 4.3 pounds it is a little heftier than something you might consider putting in your carry-on luggage while traveling. The Survivor offers 14 hours of continuous playback or seven hours at full volume. Ambiguity aside, the Survivor doesn’t seem to lack for loudness in most situations. And to be fair, it admirably refuses to resort to overdriven noisiness at high volume. Overall frequency response is reasonably flat with solid-yet-unobtrusive bass response, even when cranked up. However, higher frequency sounds like cymbals and some vocals can occasionally lack clarity in comparison to similarly priced offerings. We’d wager the Survivor’s weather-proof construction plays some part in the rolled off treble, and considering the device was made with outdoor use in mind – where ambient sounds will undoubtedly affect the listening experience anyway – the compromise in nuance seems like a reasonable tradeoff. Ultimately, what the Survivor lacks in aural refinement, it makes up for with sheer auditory grunt. 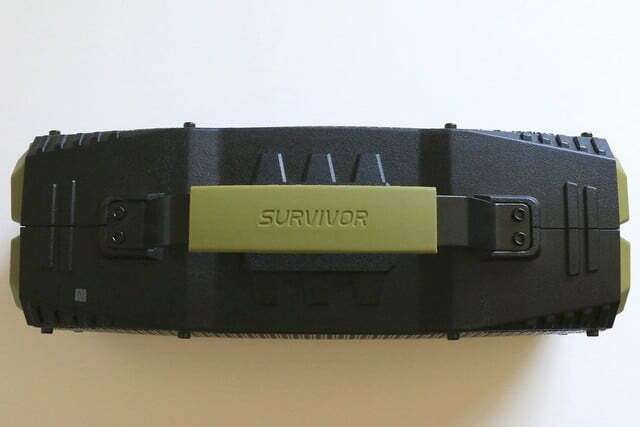 Much of the Survivor’s heft is due to the 12,000mAh lithium polymer battery housed inside. DreamWave says it offers 14 hours of continuous playback or seven hours at full volume, and after an afternoon’s worth of casual use in the backyard, we see no reason to doubt that claim. We’d even go as far as to call it conservative. After eight or nine hours of use at moderate volume, it still had more than half a charge left. But the Survivor’s other features yielded less enthusiasm. Despite that massive battery, the USB charging port’s performance was lackluster at best. While streaming Pandora through Bluetooth and charging my iPhone 6 through the Survivor’s 5V, 1A USB port for about an hour, I noted that my phone’s battery level was actually down a few percent from where it had been before plugging it in. Similarly, I expected the LED light on the Survivor to be the ultimate heavy-duty flashlight, but its performance fell short here as well. In a side-by-side comparison, the Survivor was noticeably outperformed by a small LED flashlight powered by four AAA batteries. To test the jump starting capability of the Survivor, we disconnected the battery on our car, which is powered by a 5.7-liter V8, and hooked the leads directly to the Survivor’s jumper cable attachments. Sure enough, the fully charged Survivor allowed the engine to crank over on the first attempt. Although the manufacturer’s claim of the Survivor being able to jump a 7.0-liter V8 is somewhat arbitrary without more specifics, I can report that it will function as intended on a factory-stock 5.7-liter Dodge V8. For occasional use – as the Survivor’s jumping starting capability was likely designed – it should be able to get you out of a jam. But what’s the likelihood your car battery dying in the middle of nowhere and you having the wherewithal to bring a fully-charged Survivor and its jumper cable adapter along for the ride? That one seems a bit remote to us. While the DreamWave Survivor doesn’t end up being the solution to all the needs of an adventure-minded audiophile, it performs its core function – playing wireless audio outdoors – conveniently and with solid audio performance. The battery life of the Survivor also seems to handily outperform the manufacturer’s claims, and while the USB charging and LED light functions may have failed to impress, truthfully they’re just window dressing. 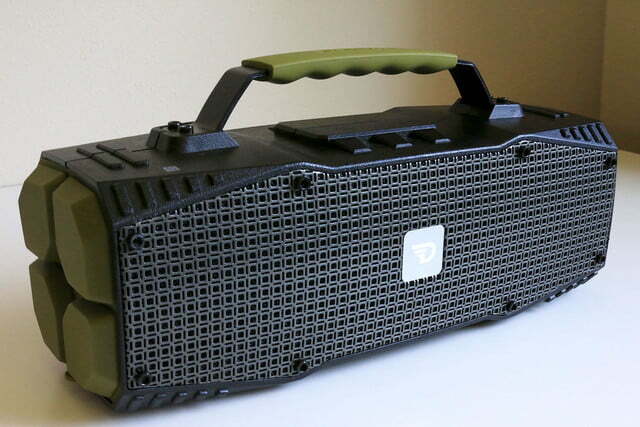 At a suggested price of $280, there are a number of other worthwhile wireless speaker options worth considering, but if you need rugged durability, resistance to harsh outdoor elements, and the ability to jump your car from your Bluetooth boombox, you could do a lot worse than the DreamWave Survivor. Just don’t forget those jumper cables.